Estella can't eat yeast so for lunch Andrea made beer bread which is apparently OK because the yeast has been filtered out. Estella phoned her mum on the satphone so she could wish her happy birthday. 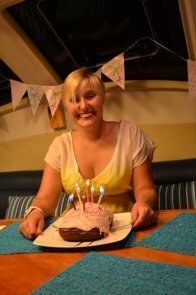 In the evening we had a mexican fiesta - nachos, fajitas and bunting - followed by birthday cake cooked in the breadmaker and decorated with pink frosting and sprinkles. Andrea says to put that we also all wore sombreros and had one of those four piece mexican bands that has a name noone here can remember. I don't think she is taking this blog very seriously.